Left wing groups have condemned recently-announced decision to construct 550 housing units in Jerusalem Wednesday. The newly-issued building permits include 386 units in Har Homa, 136 units in Neve Yaakov and 36 units in Pisgat Zeev, according to AFP. Issuing permits is one of the last stages before construction begins, which means building is likely to start in the coming weeks, according to the far-left Peace Now NGO. A spokesman for the group expressed his anger at the decision. MK Zehava Galon of the left-wing Meretz party, also attacked the plans, accusing the Jerusalem municipality of “igniting the region”. Senior Palestinian Authority official Hanan Ashrawi joined Peace Now and Galon in condemning the decision. According to figures from Peace Now, in the six months since the talks began on July 29, the government of Prime Minister Binyamin Netanyahu advanced plans for 7,302 new homes, including 4,880 in the West Bank and 2,422 in east Jerusalem. 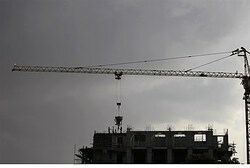 In the same period, tenders were issued for 4,460 new homes – 2,372 in Judea and Samaria and 2,088 in Jerusalem.